Camping is probably not the first thing that comes to mind when you think about how you will be spending your nights on the Big Island. Sleeping outdoors adds an element of adventure or romance to your vacation. It lets you be closer to nature and will show you an element of the Big Island few other visitors will experience. There are quite some places on the Big Island where you are allowed to camp, but camping permits are required for most of these. Rules and facilities at the campsites differ on a case-by-case basis, so make sure to check the resources below to see if you need a permit to camp. All in all, camping on the Big Island is a unique and exciting experience. It doesn’t offer the comfort that you can find in a real bed, but if you are an outdoorsy type, you will find many rewards. There are many campgrounds to choose from in lots of different climates, and spending at least part of your vacation under the star-studded sky of Hawaii is something we love doing! Do you need a camping permit for campsites on the Big Island? Camping permits are needed for most campsites located in state and county parks on the Big Island. These permits need to be applied for before your arrival, so plan ahead! Permits are not needed when staying at private lands. Have a look at for example the Hipcamp website to see a list of camping opportunities on the Big Island. Permits are required for all 10 county parks that allow camping. You can book a campsite online via the official Big Island Camp Reservation System. Permits can be purchased up to a year in advance, see the camp reservation website for prices and other details. 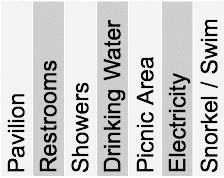 State park requirements vary within the Island. Permit applications and other valuable information such as information on the park history and archaeology, health and safety information, and the park rules, can be found at the state website. There are two camping areas within the Hawaii Volcanoes National Park. Camping here costs $15/night for the Namakanipaio campsite and $10/night for the Kulanaokuaiki campsite (July 2017 prices) in addition to the park entrance fees . Camping is on a first-come-first-served basis and no camping permit is needed to camp in the park. If you haven’t brought a tent you can also stay in a cabin at the Namakanipaio site ($80 / night) or rent a 2-person tent including an 8 inch memory foam mattress with hotel linens, a cooler, a lantern and 2 camping chairs for a total of $55 / night ($15 for the site rental and $40 for the equipment, price doesn’t include the mandatory park entrance fee). More information on the Hawaii Volcano House website. Bring warm clothes as it will get chilly at night (elevation!). More information on the campsites can be found at the NPS camping website. 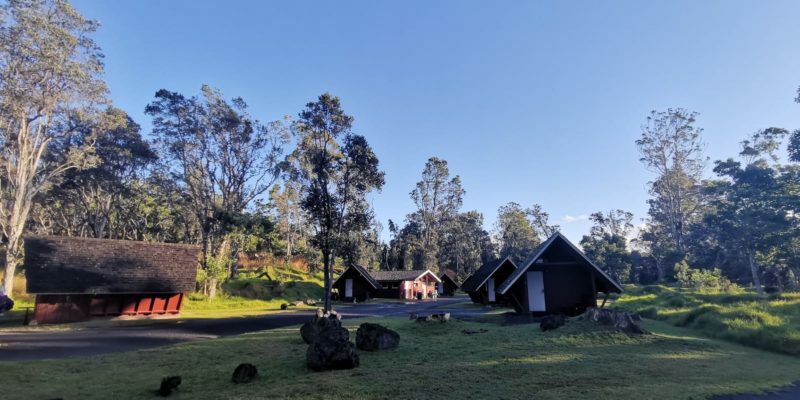 The Namakanipaio Campground in the Hawaii Volcanoes National Park contains cabins and campsites (not shown). Given the exotic names of the campsites on the Big Island choosing where to stay may be confusing. Your options include places where you can fall asleep with the sound of the breaking waves on the background while you watch the stars overhead. Or what about spending the night with your family and/or friends over freshly grilled fish from the BBQ? And did you know you can also camp on top of the world’s most active volcano? Just be sure to pack some warm clothes because nights will get chilly at 4000 ft elevation. The map below will help you orientate and pick a campsite close to where you want to be. The Hawaii County and State Parks in the following table allow camping. Please note that the facilities vary for each campsite and that some sites have no potable water. The table is a summary and we encourage you to go to the respective websites of the campsites to see the up-to-date and exact camping situation. The information in the following table has been last updated in November 2018 with information from the county/state of Hawaii campsite website (link and link). See our gallery of campsites on the Big Island for an impression of some of the campsites listed above. Choose a level place to pitch your tent that is protected both from the wind and from the sun. You don’t want to be blown out of your tent or come to a boil in the Hawaiian sun. Don’t pitch your tent in a potential puddle: if it starts raining you might be swimming. Likewise, if you are camping close to the ocean you should anticipate the high tide! Spots that look flat and dry during low tide may flood during high tide. Ensure there are no rocks or roots on the ground where your tent will stand. Nobody likes an uneven bed! Are you close enough to a potable water supply? If you have one, can you park your vehicle close enough to your camping spot so you can keep an eye on it? If there are restrooms facilities, are they within a reasonable distance? Consider your camping spot layout: Where to cook? Wash up? Eat? Light a fire? What is the prevailing wind direction (in Hawaii mostly from East to West)? How should you organize the fire so that you won’t have a smoky tent? Now that you are all set and done, it is time to start explore the island! 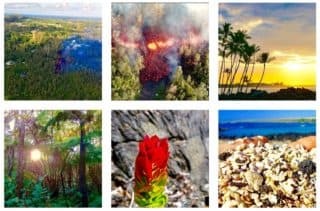 This website being a guide, we have some great resources on the outdoor activities on the Big Island. If you do not feel like reading to much but want to skip directly to the highlights: Have a look at our 3 favorite beaches (in 3 colors! ), 5 short-but-stunning hikes, and best snorkeling spots on Hawaii. Pictures and descriptions of the campsites on Hawaii's Big Island. Use this information to pick a camping place to pitch your tent and go camping.